Multiple Madness A Quilt Project Unique to our Shop! Cinda Pottmeyer and/or Chris Brauning guide you through the step by step process of fabric selection, fabric preparation, cutting your repeats, stacking your new cuts, cutting wedges (with acrylic template, (included in your class fee), sewing the wedges and selecting your background for approximately 21 medallions. Amazing how no two are the same! Sign up now! Class size is limited to only 6 per class. Pattern and 15% off for class supplies purchased at Anything Sews. FABRIC GUIDELINES FOR MULTIPLE MADNESS PATTERN What size quilt do you want to make? Below is the information on how many medallions are possible depending on the fabric pattern repeat and the amount of yardage purchased. It takes 4, 6 or 9 medallions to make a wall hanging. 3 to 4 for a table runner. 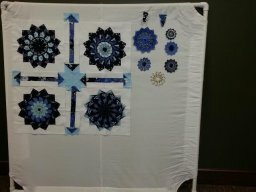 16-20 medallions to make a Queen/King quilt. If the distance between the repeat in your fabric is: 	12 inches, you will need approximately 4 yards of fabric, double this to get enough to make a larger quilt & to have enough for borders. approximately 4 yards will yield 7 medallions ? approximately 8 yards will yield 21 medallions. 	24 inches, you will need 8 yards approximately 8 yards of fabric and yield 21 medallions. It will always be approximately 4 to 8 yards because it depends on the repeat size. 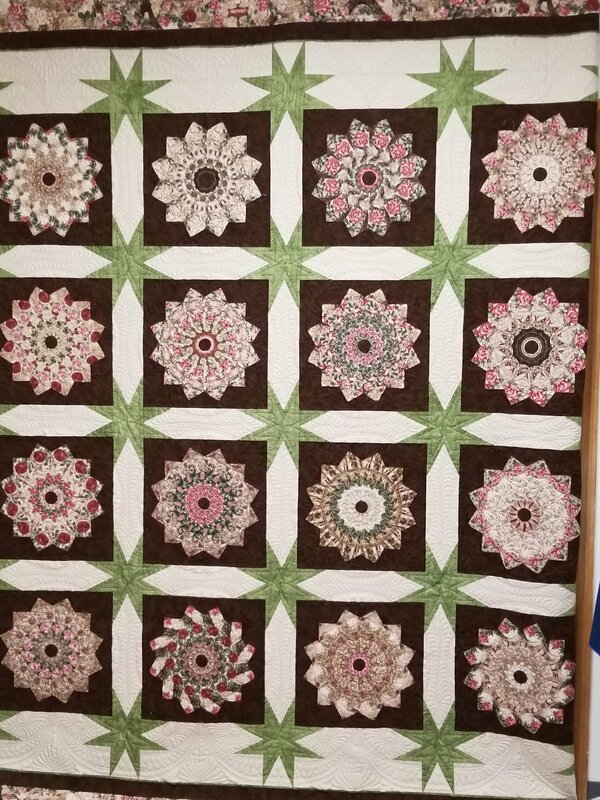 DO NOT purchase background fabric until the medallions are finished. You will need to bring: 	Sewing machine in good working order 	60 mm rotary cutter with sharp new blade 	Scissors 	Seam Ripper 	Pins 	Large cutting mat 	Acrylic ruler 6 x 24 inches 	Thread to match project or a neutral shade 	Long Basting Needle 	Contrasting thread for basting. 	Thimble 	Point Turner 	Small personal iron and ironing mat (if available) Template for your medallions will be provided at the workshop. Best to bring your lunch or order from a nearby restaurant (Grinders, Subway & Freddy's). Small kitchen available with microwave, & refrigerator. Complimentary coffee, tea, hot choc, and water. 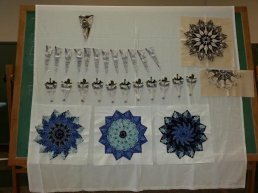 Cinda Pottmeyer and Chris Brauning are very experienced quilters with many years experience in quilting and instructing classes. Each have made several Multiple Madness projects and are ready to share their knowledge with you and keep the tradition of Multiple Madness alive!